By Chris Williams: Despite the news from former eight division world champion Manny Pacquiao and Amir Khan saying that their fight on April 23 is a “done deal”, Dean Lonergan, the promoter for #2 WBO Jeff Horn (16-0-1, 11 KOs), doubts the Pacquiao-Khan fight will take place. He doesn’t see the $38 million materializing for the fight, and he sees that there still isn’t a venue for the fight in the United Arab Emirates (UAE) either. Pacquiao’s promoter Bob Arum isn’t saying much about the Pacquiao vs. Khan fight, but he’s recently said that he doubts the fight will take place. If Pacquiao doesn’t fight Khan, he may be stuck with just the option of fighting Horn. Even if Pacquiao does fight Khan, he still will likely have a fight against Horn presented to him by Arum. It’s unclear whether Arum doesn’t have any other options at this point for Pacquiao to fight other than Horn. With all the different contenders in the 147 pound division for Pacquiao to fight, it’s anyone’s guess why Arum wants to put him in with Jeff Horn. If holding onto the World Boxing Organization welterweight title means that Pacquiao is going to be stuck fighting guys that that aren’t well known to the casual fans in the U.S like Jeff Horn, then it might be better off for him to vacate his WBO title and choosing instead to fight popular guys. Of course, if Arum keeps coming back to the Horn fight because he wants that fight, then Pacquiao needs to make a decision. Does he please his 85-yer-old promoter by fighting Horn or does he let him know that he wants to fight popular fighters only. Pacquiao already fought two of Arum’s Top Rank fighters in Jessie Vargas and Tim Bradley in his last two fights, and not surprisingly neither fight pulled in big PPV numbers. 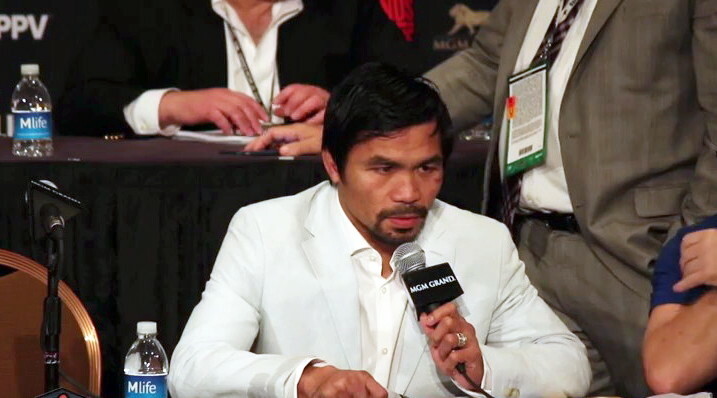 Does Pacquiao keep fighting the guys Arum wants him to, even if they’re not fights that make sense for him to take? We might see Arum looking to make fights between Pacquiao and some of his other Top Rank fighters later on this year or in 2018 if he doesn’t retire. Arum has mentioned wanting to match Pacquiao against Terence Crawford and Vasyl Lomachenko. Those are both fighters that Arum promotes. Will Pacquiao fight them if Arum has a list of fighters for him and those are the only guys on the list? Pacquiao should have fought Khan last year rather than Bradley for a third time. That was a bad move on Pacquiao’s part to agree to that fight. “If Manny really wants to pursue a fight with Khan in the UAE why doesn’t he give himself a few months to do it and come to Brisbane first for the fight with Jeff Horn? We have a very generous offer on the table with the money already guaranteed,” said Longergan. The big question is does Pacquiao have a say so in who he fights? If the Khan fight fails to take place, will Arum push for the Horn fight and say that’s all he has or will he look to sign someone that the casual boxing fans have heard of in the U.S like Adrien Broner, Danny Garcia, Keith Thurman or Saul Canelo Alvarez.